Oh, The Giant Claw. This was one of those films that I missed when I was a kid. If I had seen it then, I think that film would have been my favorite film of all time. (at least as a kid) This is a giant monster film, and anyone that knows me knows that I love giant monster films, but the design of the creature, which you see within the first two seconds of this trailer, is a wonder. 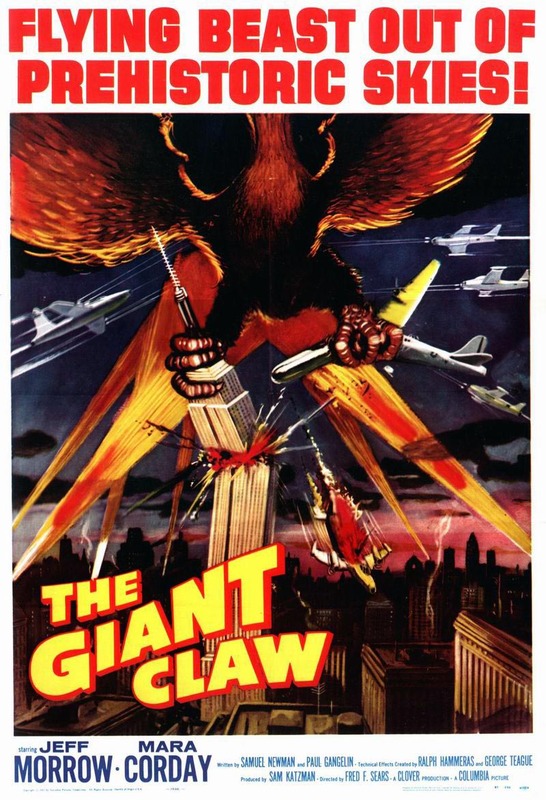 While Godzilla, Gamera, and King Kong were "normal" looking, the Giant Claw's monster is a disaster. The monster looks like a bird that hasn't eaten in forever, while trying to be the scariest thing ever. You know how people will go through body modifications, like shaving off some bone so it looks like something not human? That is the Giant Claw. The monster is so hard to describe that any answer is almost right. Does it look like a chicken whose neck was stretched out? Yes. Does it look like a duck that has been tortured for years? Kinda. Does it look like that guy who, a few years back, did a whole slew of body modifications so he could look like his pet parrot. Very much so. This film will have you laughing all the way through. You owe it to yourself to see this film.